I had never considered the purchase of a record weight/clamp until recently. I acquired a collection of original NOS vinyl, still sealed, the newest from 15 years ago. Most of the records were fine, but a couple were dished, that is, when playing side 1 for example, the label area was much higher than the outer edge of the record. On side 2, the situation was much less noticeable. The records were irreplaceable on vinyl, and even if they had been, I figured the damage was due to their being in shrink wrap for 15 plus years, rather than a manufacturing defect. After looking around for a bit, I decided on KAB Electro Acoustics USA Record Grip. The USA Record Grip is a simple device, well thought out, made of natural rubber and weighs 3 ounces. It has an additional very useful feature: it also incorporates a bubble level on the top surface. As long as the bubble is within the circle that should surround it, the turntable is level within .75 degrees. Additionally, as the weight only weighs 3 ounces, it should not put any stress on the platter bearing. Using the weight was very easy: just press the weight over the album. If it is not all the way down, you'll know. Assuming your turntable is indeed level, the level will not be within the circle. Think of it as "press and play". 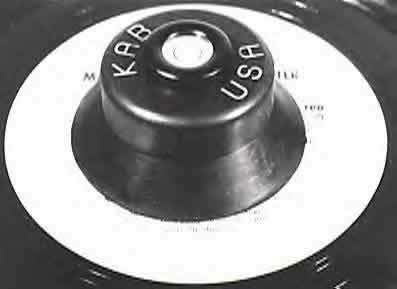 As far as a "sound" that the KAB record grip imparts on the music, I cannot be sure that it has one. I do detect a slightly clearer sound, with more detail, but I cannot be certain that it was not imagined. That is to say, I cannot be certain that I didn't hear something that I wanted to hear. On the other hand, my records are now indeed flat, and the problem that I was experiencing has been rectified. I do see two distinct advantages to the weight: firstly, playing a flat record must, in my opinion, be much kinder to vinyl as well as the stylus. When playing a warped record, the stylus must "dig" into the leading edge of the warp, and "coast" on the trailing edge. Additionally, a warped record will induce much more subsonic information into the rest of the system, especially the speakers. Neither of these situations are desirable, and the record weight drastically reduces both. At roughly the price of one or two new LP's, you can't go wrong.